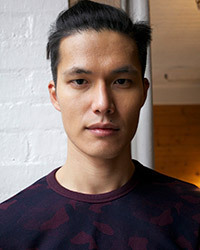 Dae Na was born in South Korea, is an Korean male model. He was discovered by fashion photographer Hudson Taylor. He began his modeling career in 2012, signed to modeling agency Wilson Model Management in NYC. Dae Na's hobbies are playing guitar, watching movies and singing. He made his acting debut in TV Mini-series The Romance Artist (2015) in role as Devin Lee. GQ Taiwan, American Vogue, Out Magazine, Lab-A4 Cover, August Man Malaysia, Harper's Bazaar China, Man of the World, GQ Style Brasil, Harper's Bazaar U.S. and UK, L'Officiel Hommes Germany, Numero Homme China, DSECTION Magazine, GQ Germany, Esquire U.S., V Man, Manifesto, Glow Thailand Cover, Vogue Hommes Japan Cover. Walked runway for Nautica, Joseph Abboud, Banana Republic, Polo Ralph Lauren, Todd Snyder, Chanel, Public School, Porsche Design, Michael Bastian, Corneliani, Brioni, Ermanno Scervino, Dolce & Gabbana, Perry Ellis, Roccobarocco, Moschino, John Richmond, Salvatore Ferragamo, Calvin Klein. Shanghai Tang, Forever 21, Louis Quatorze, L'Oreal, Tom Ford, Armani Exchange, Lane Crawford, Strellson, Essential Homme, Donna Karan, Diesel, Bloomingdale's, Benetton. Represented by agencies New York VNY Models, Paris New Madison, Elite London, Milan d'management group. I don't have a specific mentor but I learn from every photographer and person I work with. I have thing for an exotic food, not always a good thing, so traveling around in the city or elsewhere. Finding good places to eat.